Okay, first – the one thing you shouldn’t worry about is music you’ve uploaded to SoundCloud. As I wrote at the end of last week, you should worry if you have media that’s important to you that’s located in any one place without backups, SoundCloud or otherwise. But while there have been plenty of signs SoundCloud’s business is seriously troubled, that doesn’t necessarily translate to any indication you’ll lose access to the service. SoundCloud co-founder and CEO Alex Ljung was left scrambling in the wake of deep layoffs to assuage user fears. He took to the phones with at least one celebrity user, Chance the Rapper, who reported a “fruitful” call with the exec on Twitter Friday. The music you love on SoundCloud isn’t going away, the music you shared or uploaded isn’t going away, because SoundCloud is not going away. Not in 50 days, not in 80 days or anytime in the foreseeable future. Your music is safe. Alex also refers dismissively to “an insane amount of noise” about the company. But let’s back up. SoundCloud’s CEO can’t just shrug off fear and uncertainty when the company’s own messaging, actions, and even financial filings are largely responsible. Whatever’s going on with SoundCloud’s business, the company has lost control of its image. It’s hard not to view this “noise” as partly SoundCloud’s fault. Co-founders Alex and Eric are each articulate and passionate advocates of music sharing. But the company has for years failed to articulate its business model. It’s talked about subscription services like SoundCloud Go, without being clear about how it can compete with entrenched competitors, and talked about advertising without being clear about how it will attract advertisers or how those ads will be effectively delivered. It’s been evasive about details of revenue and profit. It’s allowed bad press to accumulate, like allowing lavish office photos to spread just as financial filings were adding to concerns about its future. It has often failed to go on the record with press outlets (not mine, major press), while small rumor blogs flooded the narrative with leaked (and often inaccurate) information. questioning whether the company will survive. Presumably these layoffs were planned for some time, so why did SoundCloud appear to be improvising its message to the press and its own staff? I know SoundCloud can do better, having covered the company since its 2008 founding. I know its founders can do a better job of messaging than this, too, having known them almost as long. Rather than simply imploring its users to help, they need to provide a better picture as soon as possible as to how revenue growth will work versus costs – particularly now, having cut some of the staff who were responsible for making that revenue growth happen. 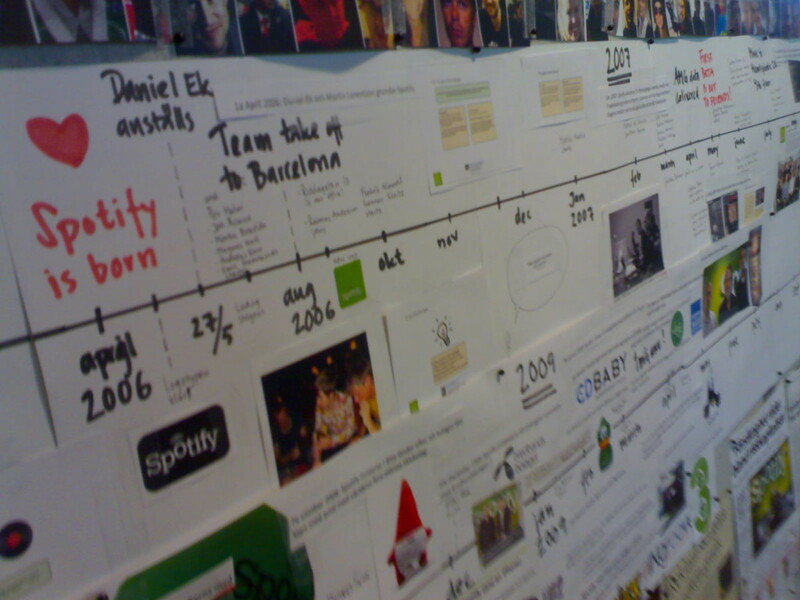 A Spotify timeline. Photo (CC-BY) Jon Åslund. That said, I think SoundCloud are unfairly bearing the brunt of bad press and angry musicians. Let’s not mince words: right now, the whole model of streaming appears economically broken, and surely all the major players deserve some share of the blame. Talk about a rock and a hard place – maybe “buried under a pile of rubble” is more apt. Content creators and owners believe they should get paid for music being streamed. So you’ve got the industry that represents them asking for higher royalty rates. Advertising is the one thing that will grow with increased listening, at least in theory – more listening means more revenue for ads. But listeners and even content creators have been resistant to advertising. And selling ads in sufficient volume and with significant value means you need to have a talented staff able to liaise with big agencies and advertisers. Google is the one tech company who seem to have built a significant competency in the ad business, but they claim they’re not making money on ads, either. And it gets worse. Largely missed in all the coverage of SoundCloud last week (but observed by some CDM readers), it’s really YouTube that dominates streaming. The Washington Post has just painted a bleak picture of the value of those YouTube plays to music. “The industry should be really, really careful because they could close their eyes and wake up with their revenue really concentrated in two, three sources,” said Lyor Cohen, YouTube’s global head of music, referring to Spotify, Apple Music and Amazon Prime Music. Right, so it’s better if it’s concentrated in four, and the fourth is Google? Huh? I wouldn’t normally compliment the record industry, but to the credit of groups like the RIAA, at least they’re exerting some pressure up. The problem is, even a $7 royalty per 1000 streams may prove negligible to smaller artists and labels – and if the business that pays that royalty can’t survive, it’s a moot point anyway. So, uh, how’s everyone feeling? Super… happy? No? Of course, the buzzword that everyone seems to be running to at the moment is the blockchain – offering decentralized content and paying creators more directly. But describing one part of a larger solution isn’t the same as describing the whole solution. Will listeners embrace micropayments for music, or will they find it a hassle? What will make them migrate from services they’re already accustomed to using – and in which they’ve already assembled playlists and preferences? What about the fact that services like Apple’s are already integrated with the listening devices they own? How do you convince listeners to change their mind about what music should cost, when they’ve already grown accustomed to $10 monthly fees – or, very often, no fee whatsoever? It isn’t all bad news. People are listening to more music. Streaming isn’t a nonexistent business – it’s US$7.7 billion in the United States alone. Someone, somewhere is actually earning money. Also, because of the cost of PR and building fanbases, and the potential revenue earned from paying live (or selling physical goods), a lot of musicians I’ve talked to really do appreciate the promotional value of online streams. There are plenty of cases where giving away streaming music is viable – because you might then sell people vinyl, for instance. At the very least, it seems totally valid to me that people who make music have reason to be frustrated. I think we should continue talking about our own solutions. And I’d like to see the captains of industry – music industry and tech industry alike – take some greater responsibility for what’s gone wrong and how it might go better. Well… one can dream, anyway. So, uh… vinyl? Cassette tapes? Eight tracks?